The first introduces us to Oliver (Joshua Silver) and Daniel (James Lance), a gay couple who are holding a baby shower with Priya (Chetna Pandya), the surrogate mother of their unborn baby. This fast-paced and witty opening demonstrates Thompson’s flair for impeccable dialogue, which is both effortlessly natural and poetically rhythmic. When Daniel’s mother turns up unannounced, the protagonists’ pasts take a relentless probing, causing the worst of their personalities to be spat out across the room in defence of their own motives. Although the concept and character types are very familiar - outspoken and offensive mother, protective son and indignant partner - there is nothing cliché about this scene and all four actors flourish beneath the flighty dialogue. Chetna Pandya sparkles with charisma and is captivating to watch, even when simply observing the room. Joshua Silver carries Oliver’s mannerisms so convincingly that you begin to question whether you know him outside of the theatre. It would be very easy for Daniel’s mother to exist only as a plot device, hacking her way into Daniel and Oliver’s relationship until the cracks cover the surface. However, Joanna Bacon’s vigour and exquisite comic timing prove her performance in the opening act one of the highlights of the play. The more we learn about Daniel’s damaging childhood, the more his own aggressive and abusive behaviour begins to show, causing irreversible rifts in his relationships and threatening the future he thought secure. In dramatic contrast to the acts that envelop it, the second act takes place inside a courtroom, in a gripping battle for the custody of the new-born child. Though this scene introduces two slightly exaggerated characters, the judge (Donna Berlin) and Priya’s lawyer (Joanna Bacon), it dances between this comedy and anguish, exploring gay rights in the eyes of the law, notions of masculinity and what constitutes abuse. The final act returns to Daniel and Oliver’s home. In the aftermath of his messy legal battle, Daniel continues to bare a fragile emotional state, but rather unconvincingly so. It is unclear whether this is an intentional front, an oversight in the script or a performative approach, but the character of Daniel seems most tangible in his controlling and aggressive displays of behaviour. It would be foolish, in 2017, to force a moral reading onto the conclusion or to assume that characters get their comeuppance, but the nature of a play that raises so many big questions leaves you scrambling to put together the pieces. And in this case, the pieces just don’t match up. Does the right party end up with the child? Do we know the absolute truth? Is this a play about abusive relationships? Or is abuse a plot device to facilitate the exploration of masculinity and gay rights in custodial law? 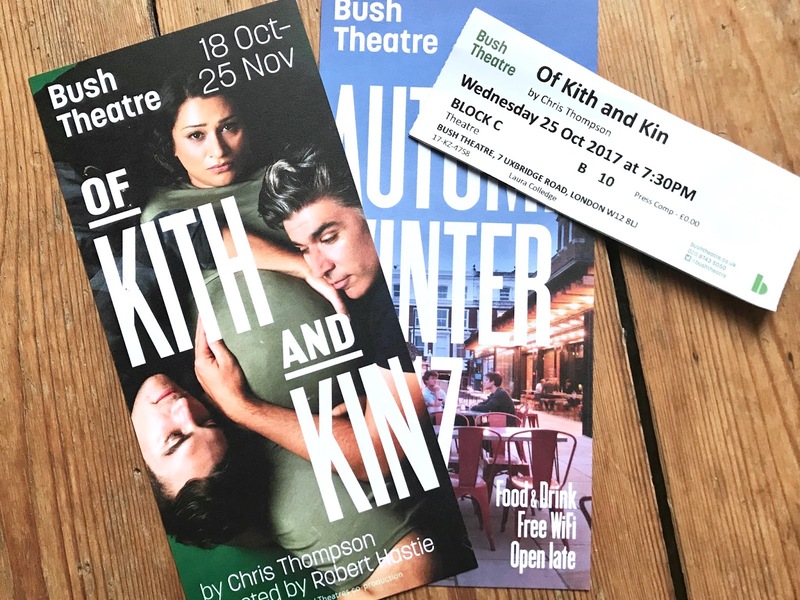 Of Kith and Kin is playing at Bush Theatre until 25th November.